Oscar Movie: "The Maltese Falcon"
Sam Spade (Humphrey Bogart) is a private investigator willing to work for whoever is willing to pay. When a Miss Wonderly offers him and his partner, Miles Archer (Jerome Cowan), a few hundred bucks to tail a man named Thursby, who supposedly has a relationship with Miss Wonderlay's sister and is keeping them from seeing each other, they accept the seemingly easy task. When his partner Archer and their subject, Thursby, turn up dead the next morning, the police zero in on Spade. He must find out what happened and locate the real killers to save his own skin. It turns out, he was being lied to and Miss Wonderlay is actually named Bridget O'Shaughnessy (Mary Astor). She is entangled in a plot to find a rare artifact called the Maltese Falcon, which is so valuable that people are willing to anything, even kill for it. If there was a quintessential movie that captures the essence of the film-noir genre like no other, it would definitely be "The Maltese Falcon." Even in the black and white era, the film has a darkness to it that lends to the overall mood of the film and gives it a sinister feel. Add this to Humphrey Bogart's fantastic, fast-talking, slightly misogynistic portrayal of detective Sam Spade and you've got a recipe for greatness. Sam is the story's imperfect hero, who often does good but is willing to look the other way and do wrong when the money is right. He is very self-serving and often marches to the beat of his own drum throughout the movie, but we like him none the less. Bogart has this insane charm about him, and even though you know he's in the wrong, you don't really care. His dialogue as he works everything out is enthralling. Bogart and his character just ooze charisma and coolness. This film encapsulates Humphrey Bogart at his best. As we mentioned, the dialogue in this movie is outstanding and it is full of so many great lines. "The stuff that dreams are made of," in particular, is one of the most memorable lines in film history. Bogart is great at delivering the dialogue with Spade always throwing out quips and sharp retorts. The rest of the cast is excellent as well. Peter Lorre is great as Joel Cairo, one of the shady individuals who wants to get his hands on the falcon. His distinct voice always adds a little something extra to his role and it almost makes him sound sneaky. 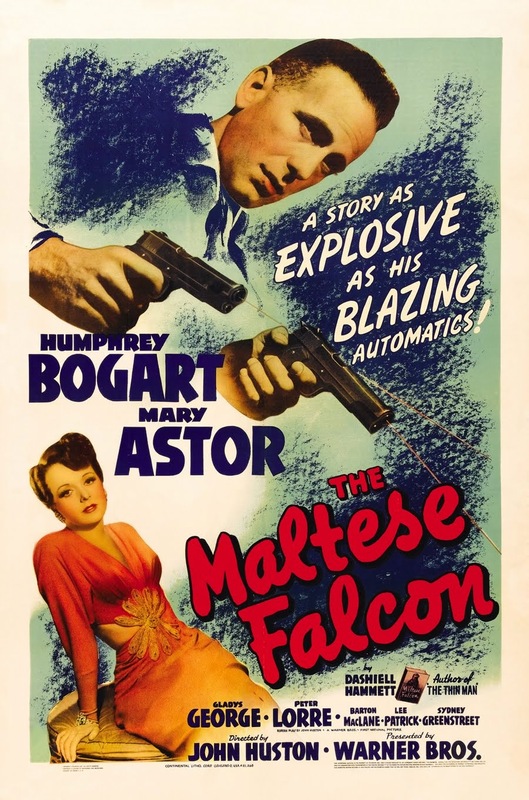 Sydney Greenstreet, in his film debut, is also great as Kasper Gutman, another large personality criminal element trying to retrieve the falcon. Gutman has a much more commanding presence on screen and gives off a king pin, crime boss vibe. Then, there is Mary Astor as Brigid O'Shaughnessy, beautiful, dark and mysterious, but also a scoundrel in her own right. She uses her looks to manipulate men and help bend them to her will to get what she desires. At its core, "The Maltese Falcon" is a crime-ridden drama with amazing actors and tons of iconic scenes and lines, but when you peel back its layers, it's actually much more than that. It is a complex film-noir wrought with intrigue, action, double-crossing and an overall flawless aesthetic. It is full of chicanery and pulls you deep into the story and completely enthralls you, and even over 70 years later, it still holds up. If we had to make a list of films one should see in their lifetime, "The Maltese Falcon" would certainly be on it. Together, these actors and actresses make up one of the finest casts ever put together on screen. This is one of the true film greats. I do love this movie! It's one of the few films I own more than one copy of, just in case. Also, the chemistry between Bogart, Greenstreet-Lorre is simply unbeatable. We love the chemistry in this movie, too! It is one of our favorite "old school" movies. It's hard to dislike a Bogart movie!